I knew I had reached middle age when I started to get interested in birdwatching. I’ve always liked birds; I’ve always looked at them, but when I started buying birding guides and feeders and keeping a Life List, I knew I was officially on my way to Fogey-dom. We exchanged a few pleasantries and she moved off, and I began to look up the birds she’d mentioned and try to find them on the rocks, which is most definitely a backwards way of birding. I peered and peered through the binocs, scribbled some notes about what I’d seen and after an hour, called it a day. I was exhausted. In my most rabid birdwatching stage, I must have been difficult to live with. I was expecting John home for lunch one autumn afternoon and was idly looking at my backyard feeders, when I noticed a flock of brownish birds sitting high in a neighbor’s tree. At first I thought they were sparrows (too big) or starlings (too quiet) and when I finally looked at them through the binoculars, I realized I was looking at a flock of cedar waxwings, a bird I’d always wanted to see (that’s one at the top of this post). 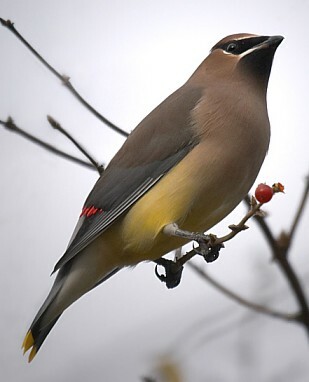 John pulled up in the driveway about then; I met him at the door, pointing skyward and gibbering, “CEDAR WAXWINGS! CEDAR WAXWINGS!” He refrained from rolling his eyes, but just barely. These days I’m a calmer birder, and I’ve discovered that I’ve also become a decent birder. Last week when I visited my sister Margaret, we went to a birding clinic at the local REI. The very young man who was conducting the clinic referred to the birds as “kids,” which was absolutely charming. At the end of the session he ran through a series of bird slides and let us try to ID them, and I found that I knew a lot more than I didn’t know. I’m still stymied by a lot of the gulls, and most sparrows and warblers tend to fall into the LBJ (that’s birder-speak for “Little Brown Jobs”) category for me, but I can now ID a new bird with a certain level of serenity. I miss the old excitement a bit, when all birds were new to me and every bird was fodder for the Life List – but now I’m like the woman in San Francisco, to whom the birds are old friends, to be recognized without guides and without binoculars. Oh, man, you missed a fantastic show this weekend at the Yellow House in the Pines. At least five red-shouldered hawks were tearing around, screaming their brains out, on Sunday morning when I went on the deck to read the paper. I saw at least three flying at once while I could hear two in the trees on opposite sides of the cul de sac, so that’s how I come up with five, but there could have been more. Two came and perched in the trees in back of the house briefly — they seemed to be harassing each other, jumping up and flying around, then perching again briefly. I am wondering if perhaps my neighborhood birds just fledged a brood; I keep meaning to email Mr. Bird Man from the lecture and ask if he can explain. Anyway, it was tremendously weird and cool.